With its beautiful tipped coat, a very affectionate and playful breed that gets along well with children and other pets making the Burmilla a great family companion. Where does the Burmilla come from? 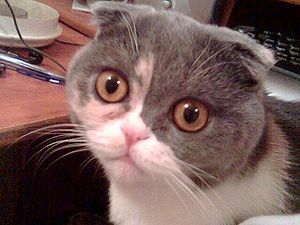 An accidental mating in 1981 in England of a Burmese and a Chinchilla was the start of the creation of the Burmilla cat. Owner of the parent cats, Miranda von Kirchberg, brought the resulting 4 kittens to shows in England. With their Burmese body lines and silver tipped Chinchilla-like fur color tips, the Burmilla created interest. 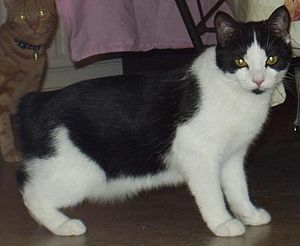 The breed is still in the experimental stages as it is difficult to create the correct body type and coloring, making the Burmilla a rare cat. What does the Burmilla look like? 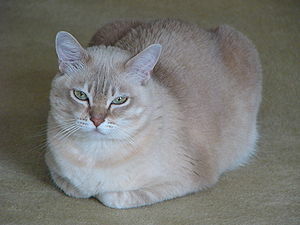 The Burmilla is a medium sized cat with a body much like the Burmese – a bit stocky and muscular. The head is roundish, tapering to a short wedge. Ears are medium to large. Weight is from 8 to 12 lbs. Eyes are any shade of green. Legs are slender with oval paws. The tail tapers to a roundedtip. The coat is slightly longer than that of the Burmese, soft and glossy. Colors are black, blue, chocolate, lilac, silver, gold, red, cream and tortoiseshell with tipping or shading. Tipping makes the fur seem to sparkle. Burmillas are moderate shedders and brushing once or twice weekly will remove loose hairs. The long-haired Burmilla should be brushed 2 to 3 times weekly. Do Burmillas make good pets? Burmillas have very good dispositions and make excellent pets. 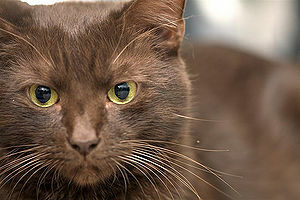 They bond closely with their humans and love to be petted but are not overly demanding of attention . They are affectionate and playful. They liketo play with toys and can learn to do tricks. Burmillas get along well with children who treat them kindly and other pets making them a great choice as a family member. Other pets should be introduced in a careful setting and slowly. Burmillas can be like a bull in a china shop so hide breakables. Note: Burmillas do best as indoor cats. Litter boxes must be kept clean.